The Journal of Advertising Research is a respected quarterly journal for advertising research and new insights on marketing issues. 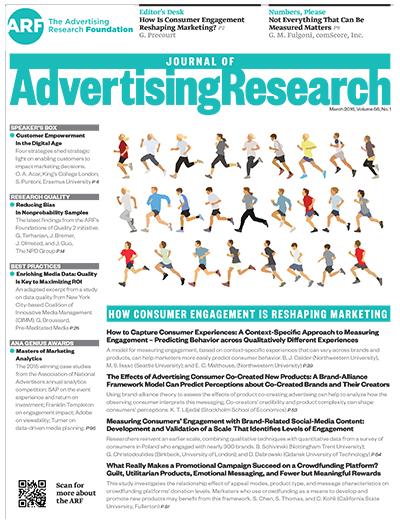 The Journal of Advertising Research is a research and development publication for professionals in all areas of marketing, including media, advertising and communications. It is published quarterly for The Advertising Research Foundation and promotes effective practice by combining business-orientated academic research with expert learning from leading marketers. The Journal of Advertising Research combines commercial practicalities with scholarly rigour. The JAR keeps us grounded, years of valuable experience written and shared with the industry to help keep us focused on more meaningful marketing and research practices. JAR is the relevant, rigorous, and current publication in advertising. It's the best of both the practitioner and academic worlds. If you're looking for fresh advertising insight that's state-of-the-art, JAR is your first source. For me JAR is a must read. It contains cutting edge research that helps define the future of advertising. Please visit www.journalofadvertisingresearch.com where you can find out what articles are in the latest issue, how to subscribe, details of how you can submit a paper, how to advertise and much more. Published quarterly by Warc for The Advertising Research Foundation.